Middelburg, Zeeland in The Netherlands is one of the most scenic places in my country. Here you will find the best things to do in Middelburg. If you were looking to spend a few days in one of the best cities to visit in The Netherlands, then you must read this. I visited Middelburg for the first time in May of 2018 and immediately fell in love with this beautiful city in Zeeland, The Netherlands. It is cute, not overrun with tourists and has a lovely and relaxed atmosphere. Middelburg is a beautiful, old city located in the province of Zeeland. There are endless things to do in Middelburg and to make it easier for you, I created this article. Middelburg, Zeeland in The Netherlands is one of the most scenic places in my country with plenty of things to do. So, if you were looking to spend a few days in one of the best cities to visit in The Netherlands, then you must continue reading as this article is a full guide to what to do in Middelburg, The Netherlands. For the ones who do not know where Middelburg in The Netherlands is located, there is a map located on the general Middelburg page of this website. I noticed quite a lot of people were searching for the city of Middleburg, Netherlands. Keep in mind it’s Middelburg so you won’t get confused when the city name has suddenly changed. Middelburg finds its origin in the 9th century and in 1217 the city got its borough rights. The city of Middelburg was at an economic high during 16th and 17 centuries when the VOC (United East Indian Company aka Dutch East India Company) and WIC (West Indian Company) dominated the world. Middelburg became the second biggest harbour of the former Republic of the Seven United Netherlands. During the second world war the city was severely damaged and at the 17th of May 1940, the entire centre of the city was burned down. After the war ended the city was rebuilt in the same style as the buildings that survived the war. So nowadays, even when it feels like you’re walking through a thousand-year-old city, in reality, most of it has been rebuilt after the war. Not that it makes it anything less special. I find it incredible how a city can be completely torn apart and rebuilt in a way that you don’t see the marks anymore, don’t you? As of today, the city of Middelburg has a little over 39.000 citizens, which is perfect really. It is also the capital of the province Zeeland, The Netherlands. Walking through the small city you find that it has a calm overall feeling. There is not much noise and especially not of cars, besides the area of the central station. It is beautiful and truly worth a visit. That’s why I thought what best way to make you motivated to visit Middelburg than to give you an article. With the best things to do and attractions to visit in Middelburg, The Netherlands of course. Middelburg in Zeeland is a city that you want to get lost in, forever. The next beautiful street after the other is waiting to be discovered. 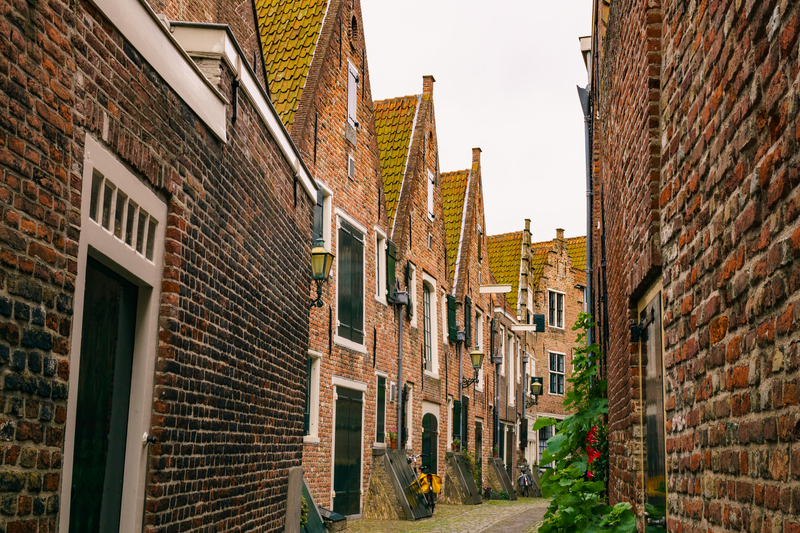 So, if you’re looking for the most beautiful streets in Middelburg, these streets below are your happy place. Many of the streets show you what was traded there, take for instance Bierkaai. Bier means beer, so beer was traded on this street. Another example is Houtkaai. Hout means wood, so wood was traded in the street of houtkaai. In the areas of Rotterdamsekaai and Londensekaai, there are a lot of warehouses and merchant houses located. The most beautiful street must be De Kuiperspoort as you can see here below. 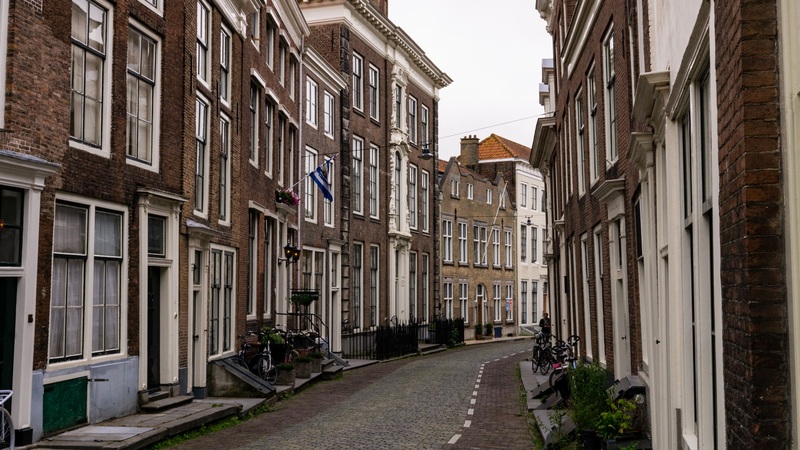 The other streets that are worth a visit are the following: Koepoortstraat, Spanjaardstraat, Molstraat, Stegentocht, Rouaansekaai, Dam, Turfkaai, Korendijk, Loskade, Schuddebeursstraat, Simpelhuisstraat. There are a few parks in the city of Middelburg, and they are all worth a visit. Some are perfect to chill out, while in another you can search for bunkers from the second world war. The reason that these bunkers are still here is that tearing them down after the war was too expensive. You can even visit one. Park Toorenvliedt is one of the best parks to visit in Middelburg. It is a big park where you will find many bunkers from the Second World War. One of these bunkers is open to the public as it has been turned into a museum. The opening times are not specific. The reason for this is that it only opens when you have emailed the foundation for a tour. The tour will last around one hour. They ask you to email them preferably two weeks in advance, the price will be agreed upon via the email. You can email them here: lcw[@]bunkerbehoud.com, don’t forget to mention that your email is for the museum in park Toorenvliedt. Park Toorenvliedt is the biggest park of Middelburg and definitely worth a visit. Whenever you feel like not seeing beautiful, cobbled stoned streets anymore, this is the place you should go to. During spring and summer Park Toorenvliedt is the place to go to when you want to have a picnic or something. During the autumn and winter days, it also has its charm. Amaliapark is another great park in Middelburg and is beautiful to cycle through. The park is quite big and will have you relaxing in no time. The Erasmuspark is the final and last park of Middelburg, The Netherlands, that deserves a visit from tourists. It’s a small, long park that is located next to the train rails, so that makes it a little less great every now and then. Although I think it is still a nice area to have a little stroll in. This manor house is located in park Toorenvliedt and was built in 1726. 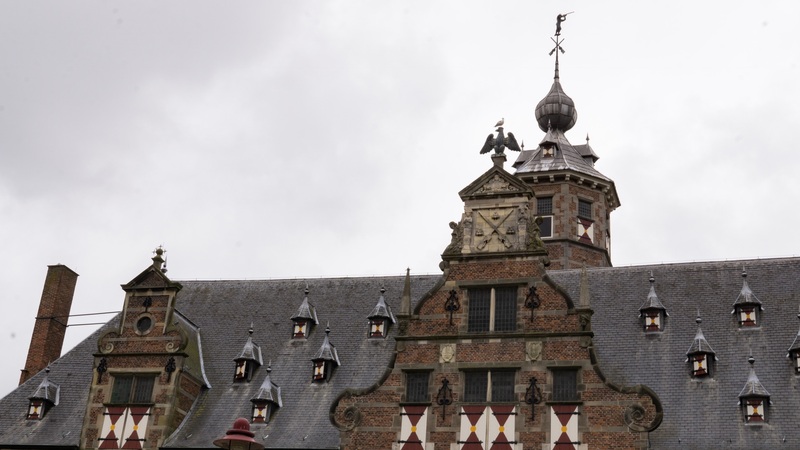 During the time it was built the manor house was located outside Middelburg, however, nowadays it is located within the city. During the second world war, it was one of the many German headquarters in The Netherlands. After the war, it was sold to the council of Middelburg by the previous owners. On the gate around the house, you will see sculptures made by Peter de Jong. He was a sculptor from The Netherlands who mainly worked within the province of Zeeland. Yes. You are reading this correct. There is a castle on the outskirts of Middelburg called Kasteel Ter Hooge. You cannot visit the castle itself. The reason for that is that people live there. Living in a castle doesn’t seem too bad. The current castle was built in the 18th century, but the castle that was on that same location previously was first talked about in the 13th century. Because of the 80-year-war, it was broken down and the current castle was built. There are several walking routes that will guide you along ponds and the beautiful estate. So, if you want to do something off the beaten path in Middelburg, The Netherlands than that is definitely worth a visit. To get there it is a km walk or bike ride from park Toorenvliedt, but it is navigable. You have to stay on the paths when you’re walking, so keep that in mind. There are many spectacular churches all throughout Middelburg. The one is bigger than the other while the next one is more detailed. All beautiful and with the same purpose, but so different. I always find it beautiful to see how churches differ per area. The church close to my hometown is so different from any of the churches here in Middelburg. The abbey is one of the most historical places of Middelburg and was built around the year 1100. Nowadays the abbey isn’t used anymore but there are city tours with great guides that will take you to the abbey. They will show you around the churches and the century-old hallways. Inside the abbey, there are also two main churches, Koorkerk (choir church) and Nieuwe Kerk (new church) and the tower, called Lange Jan (Long Jan). You can also take a walk through the abbey on your own. 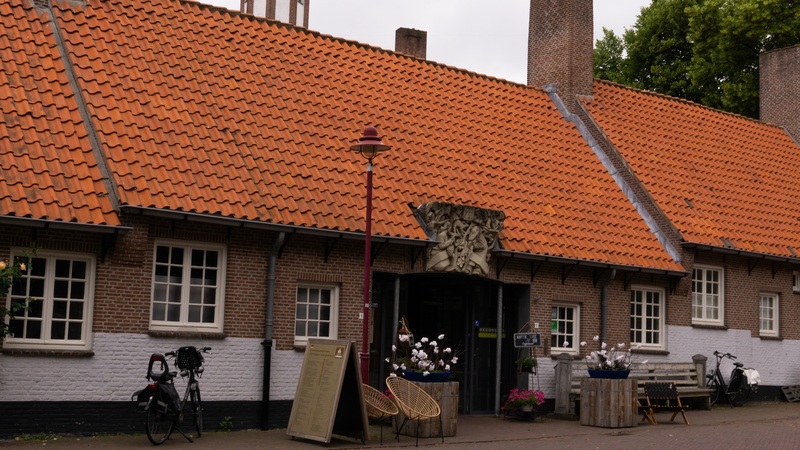 In the other parts of the abbey the Zeeuws Museum is located, more about that below, and there are offices of the province Zeeland. 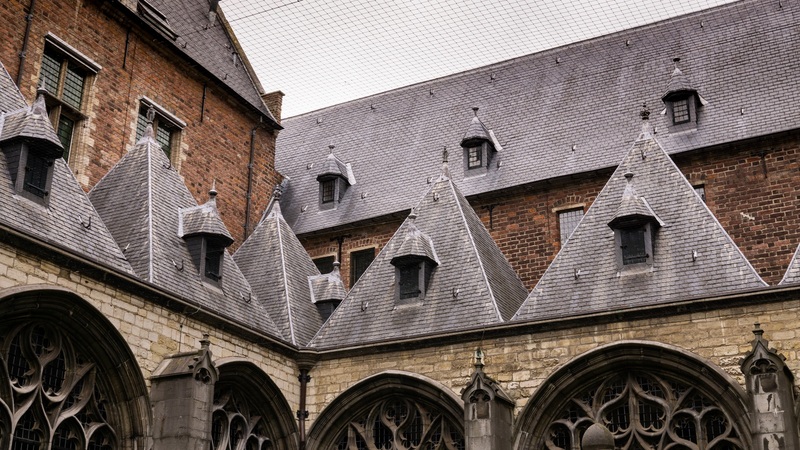 When you walk through the hallways of the abbey of Middelburg you will also see courtyards that are so beautiful that you have to sit and relax. The abbey complex even has an herbs garden. You can take a long, deep breath and enjoy the enormous size of the entire complex. Lange Jan tower: Monday 13:00- 16:00. Tuesday – Saturday 11:00- 16:00. 1st Sunday of the new Month 11:00 – 16:00. In September: Tuesday, Wednesday and Thursday from 10:30- 16:30. In October: Thursday from 10:30- 16:30. If you want to climb the dome or want a guided tour, then that will cost you 2,50 euros. Hofjes are typically Dutch and in English, we call them courtyards. 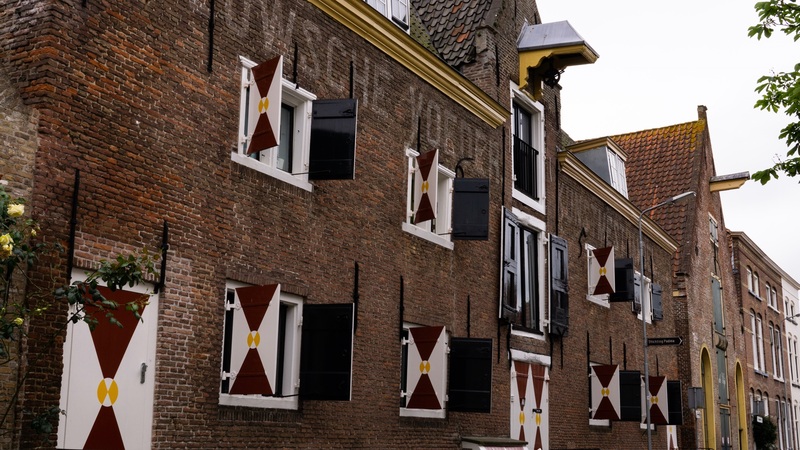 If you have explored The Netherlands beyond the crowds then you have seen hofjes before. Amsterdam, Haarlem, and Alkmaar have many hofjes/ courtyards as well. In Middelburg, you will only find one hofje or courtyard in front of the tower Lange Jan (at the Abbey complex). But, it isn’t anything like you have seen before. This used to be a courtyard with many small houses. The front is exactly the same as it used to be. Only the inside is different. They have broken down the walls of the houses and created one big ‘store/ café’ of it. And it is worth a visit. Because Middelburg was so old before it was destroyed by the war there are endless of monuments that you should visit or have a look at. This is a building that dates back to 1607 and currently houses a grand-café, cinema and a terrace. It had a function as an inn and club. After the French occupied the region at the end of the 1700s, the building became a military hospital. 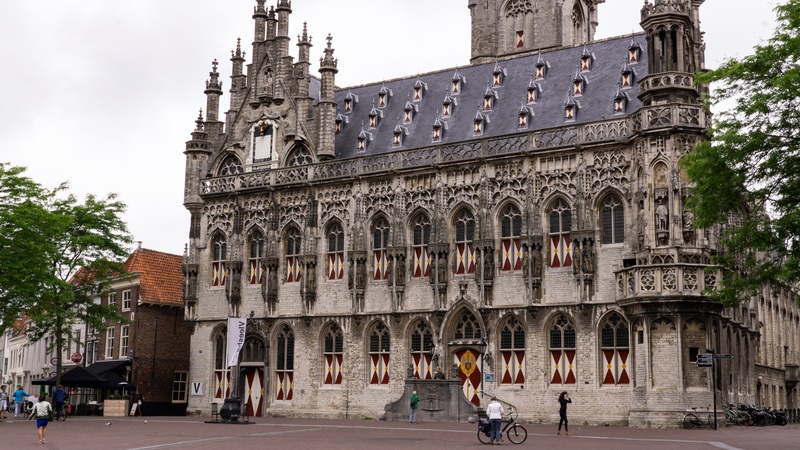 This is the old town hall of Middelburg. If you have the chance, you should go with a guide who will guide you all throughout the old town hall. Tours are held six days a week and you can buy your ticket (5,50 euro) at the Tourist Information of Middelburg within bookstore Drvkkery. The tours start daily at 11:30 and will last one hour. Literal translation is the cow gate. This city gate is the last of the eight gates that are left standing in Middelburg and was finished in 1735. The harbour of Middelburg is a wonderful area to walk through. It is located in the middle of the city and has century-old monumental buildings surrounding it. This monument exists out of fourteen façade fragments of a destroyed 18th-century house that are spread throughout the city. During the big fire of 1940 (second world war), almost the entire city was burnt down. You can find the pieces one these streets: plein 1940, Lange Delft, Onder den Toren, Walplein, Koorkerkhof, Sint-Pieterstraat, Balans, Groenmarkt, Bachtensteene, Stadhuisstraat, Zusterstraat, Hagepreekgang, Dwarskaai, and Rotterdamsekaai. This gate used to close off the Abbey complex on the Eastern side of the complex and was built around 1509. You will see a sculpture of earl Willem the second, who expanded the abbey complex around 1255 to its current size. Everyone was thankful for him, so they decided to honour him at the gate. Middelburg and markets go well together. In fact, I find that Middelburg has some of the best markets in The Netherlands. One of the things you should do in Middelburg is visiting some markets. There is a market day every Thursday (9:00- 16:00 (16:30 in summer months) and Saturday (7:30- 16:00). You can buy everything from cheese to sweaters. Almost all locally made. A few times a year on Wednesdays and/or Saturdays there are book markets and flea markets from 8:00- 17:00. During summer you will see an art, old crafts and antique market on Thursdays at ‘de Vismarkt’. This will happen every Thursday in July to August from 9:00 – 16:00. Address: around Markt 61-63. But, you will spot it soon enough. Middelburg is a historic town in The Netherlands and has definitely a few museums you must visit. These are two of my favourites. This museum is about the province of Zeeland, and while that might sound boring, I can assure you it’s not. The collection in the Zeeuws museum includes famous Zeeland tapestries. These were created in the 16th century after a sea battle against the Spaniards during the Eighty Years’ War. Besides that, it also houses a collection of contemporary art from the current province of Zeeland and much more. There are several expositions that change throughout the year, so there is always something new to explore. This museum is also located in a part of the Abbey of Middelburg, so at least the building itself is already beautiful to look at. These are the opening times for the entire year, there are some exceptions which you will find on their website here. Last hour entry (16:00-17:00): 4,75. The Vleeshal is a centre for Contemporary Art. There are many exhibits of contemporary art that you can visit, as well as other exhibits that are interesting to see. Vleeshal (literal translation meat hall) also works with many local artists from the region. It is the only centre in the entire province of Zeeland that works the way they do. 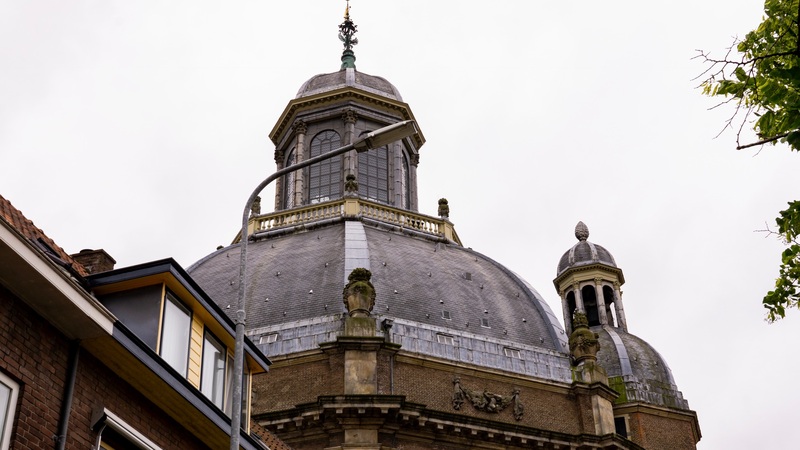 This centre is housed in the former town hall of the city of Middelburg. It is possible that the opening times change sometimes. This is because of holidays or important days. So always check their website to be sure it’s opened on the day you want to visit. This is the oldest windmill of Middelburg and was built in 1728. You can visit this mill when it is running. You can visit this windmill every Saturday from 12:00 – 16:00. It is located on the outskirts of Middelburg, so you might want to bring a bike. Canal cruise through the canals of Middelburg. If you expect to see as much canal cruises in Middelburg as in Amsterdam than you couldn’t be more off. In Middelburg, the tours are actually not that common, yet. Which is a good thing. The cruises last around 45 minutes and will set you back 7 euros if you are an adult. For kids until 11 the price is 3,75. This is a beautiful area of meadows where a lot of rare birds are living their best life. You cannot walk in the meadows, but you can enjoy this area the most when you are walking or cycling. This is a 15-minute cycling ride from Middelburg. Do you want to go shopping in Middelburg, The Netherlands? Then I would suggest you head to the segeerstraat (street) and surroundings. You will find everything you want right there. 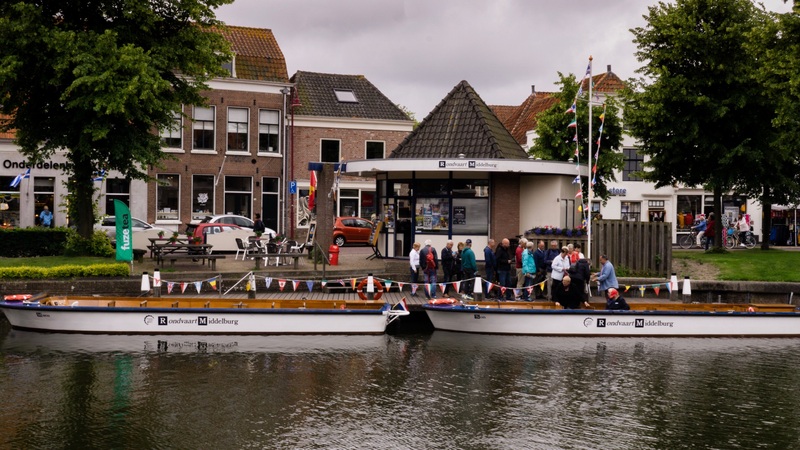 During the spring/summer period there is a daily tour that will take you from Middelburg to the Veerse lake. Via there you will go through the channel of Walcheren in the direction of Veere. There will be a short stop at the cute and small town of Veere when they return again in the direction of Middelburg. This entire cruise will last around three hours. The tours run from the last Sunday of April until the last Thursday of September. The cruises leave from Middelburg at 14:00 at the Loskade, opposite from the NS train station. The price of a cruise is 14,95 for adults and 10,25 for kids aged 4-11. Dogs can go on board as well with an extra price of 2, 00 euros. The entire ship is suitable for invalids. There is a special elevator, toilet and no bumps on the floor. 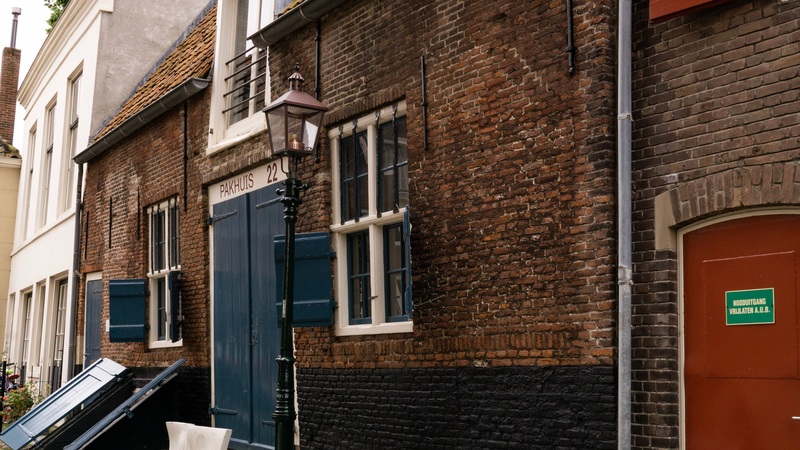 If you are looking for the best accommodation in Middelburg, then here are four places you should stay at in Middelburg, The Netherlands. As Middelburg is a small city, you won’t find very cheap accommodation here. For accommodation I usually prefer bed and breakfasts, simply because they immediately connect you to locals who know everything about Middelburg that you’d want to know. They can give you extra tips of things to do in Middelburg, The Netherlands. B&B ‘t Poorthuys. Have a look at the current prices here. Slapen in Middelburg. Have a look at the current prices here. Bed & Breakfast Adrichem en Scherpenseel. Have a look at the current prices here. B&B Parijs aan de Kaai. Have a look at the current prices here. From Amsterdam Centraal: Take the intercity train (yellow train) in the direction of Vlissingen. Get out at Middelburg station. This will take you almost three hours. From Rotterdam Centraal: Take the intercity train (yellow train) in the direction of Vlissingen. Get out at Middelburg station. This will take you a bit more than 1:30 hour. From Utrecht Centraal: Take the intercity in the direction of Rotterdam Centraal. Get out at Rotterdam Centraal. Take the intercity in the direction of Vlissingen. Get out at Middelburg train station. If Middelburg is not on your must-see list of The Netherlands, then I don’t know what is. The city has become one of my most favourite of my entire country and that says a lot. It has the Zeeuwse, this is what we call people and things from Zeeland, gezelligheid. Have you been to Middelburg? And is there anything else you like to add? Have a look at my other articles right here. Share this post!! Hey there! My name is Manon and I'm the founder of Visiting The Dutch Countryside, a local travel blog about The Netherlands. I also wrote the article you just read. I'm a Dutch, born and raised, travel blogger. I decided that it's time that tourists explore The Netherlands beyond the crowds and not just Amsterdam. Have fun exploring The Netherlands!